Welcome to the website of the International School Groningen. We are happy to tell you about our school and show you what goes on at the ISG. The International School is a relatively small school in Haren, a few kilometres from the city of Groningen, in a green and quiet environment. Sharing a campus with Maartenscollege gives us access to some excellent facilities. What school of 200 students has access to 11 labs, 3 gymnasiums and specialised art and design rooms? 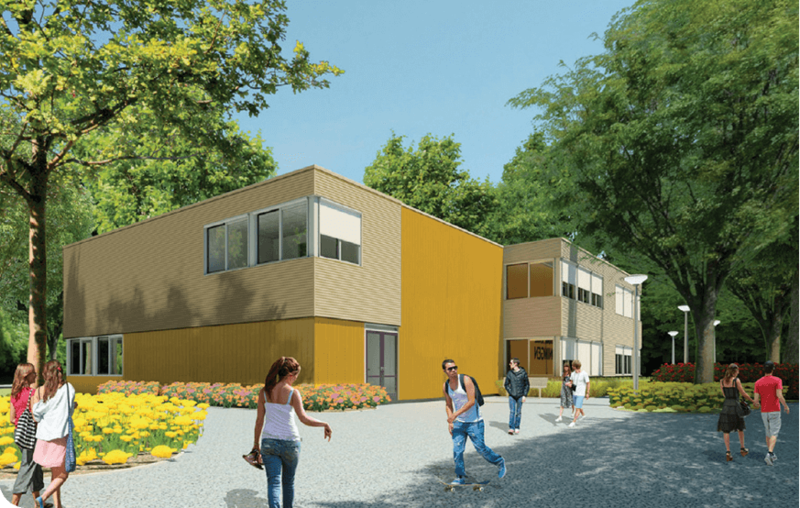 What’s more, a new building is in the making, opening at the end of 2018. Most of our classes range from 15 to 22 students. Our teachers are passionate about their work and committed to their students. At ISG the students are expected to participate actively in the lessons. International School Groningen is a school for international students who live in the north of the Netherlands. We all speak English at the ISG, because our students come from all over the world. 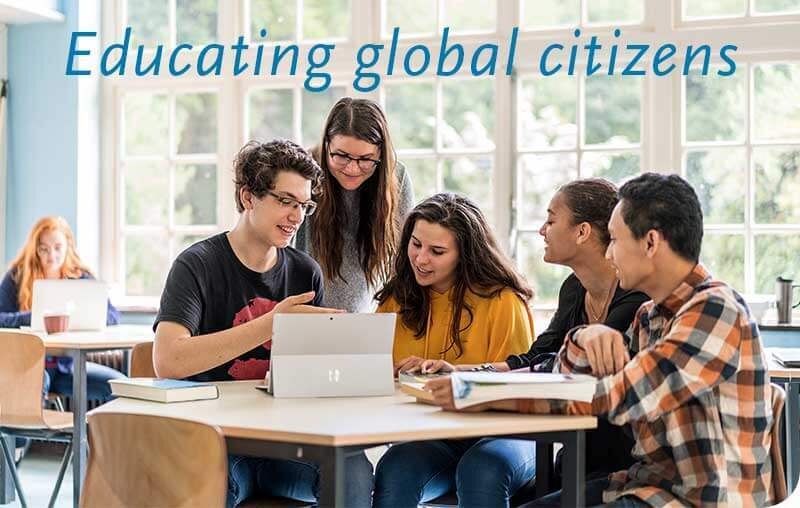 At ISG we educate our students to become global citizens. 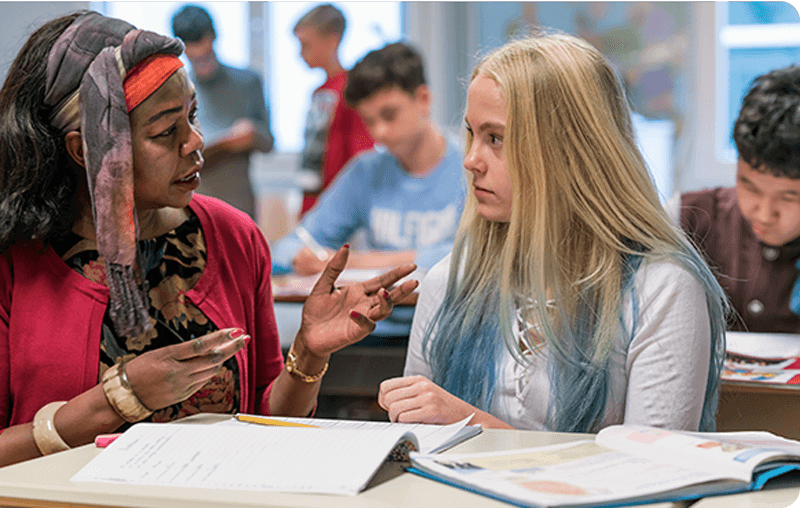 As an International Baccalaureate World School we focus on skills and qualities of character. We stimulate global awareness and crossculturalism. Our students learn by working together and are encouraged to have an open mind towards other cultures, religions and ideas. We teach students to think freely, to be flexible and reflective, and we give them the tools they need for their future education, wherever they may go when they leave. But ISG is not just about learning and work. School should also be fun. When you look back on your school days, you will remember the trips you took and the fun things you did with your class mates rather than the great projects you did. So, in the process of achieving our objectives as a school, we do everything we can to make the ISG a great place to be. We take our students on trips, organise sports events, culinary evenings, movie nights, and much more. The curriculum of the International School Groningen is based totally on the curriculum from the International Baccalaureate Organisation. 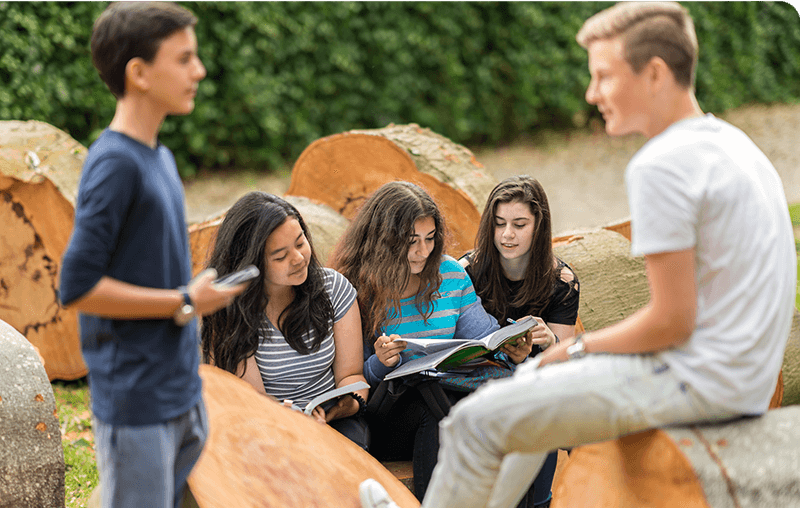 Students in the first five years, between 11 and 16, follow the Middle Years Programme and can then move on to the internationally acclaimed IB Diploma Programme (16-19 years). The IB Diploma is accepted worldwide by universities. We believe that education can be high-quality and fun at the same time. If students don’t enjoy a lesson, they will not learn. Our learning material focuses on working together, and we stimulate both students and teachers to be creative. Parents expect us to educate their children to become responsible world citizens and deliver creative, critical and meaningful contributions to society. In addition to getting good practical and theoretical preparation for their future, students expect to enjoy their time at ISG. They expect the teachers to return their work within a reasonable amount of time and to get useful feedback as and when appropriate. Teachers have high expectations of students: they expect them to do their best and to take responsibility. Setting high standards for one another keeps everybody on their toes, and that is a good thing. We see our school as a community where students make friends and learn together. That’s one of the reasons why we focus on group work rather than individual work. At ISG students work together on projects and stimulate each other. Besides being more effective, it is fun to learn together. At ISG we have an eye for the individual needs and talents of our students. Teachers know their students well and notice problems quickly. Because lines are short they can respond immediately to the smallest of signals. International School Groningen is a school for international students who live in the north of the Netherlands. We all speak English at the ISG, because our students come from all over the world. Groningen, nicknamed the ‘metropole of the north’, is a lively city of about 200,000 inhabitants. It boasts three universities - Groningen University, Hanze University of Applied Sciences and Stenden University of Applied Sciences. As a result, the population of Groningen includes a considerable number of young people. There are many restaurants, bars, events and festivals in the city. Never a dull moment in Groningen! After graduation many students find work or set up a business in Groningen, which makes the city an attractive and stimulating place for people of all ages. And breath-taking green areas and endless views are always just a few minutes away. Many expats who originally intended to move on after a few years end up deciding to stay in Groningen. The parents find jobs in or near Groningen, their children decide to go to one of the universities and enjoy Groningen’s rich student life. ‘Groningen is a very practical city. Initially a separate department of Maartenscollege, the International School Groningen was founded in 1984 to provide education for international students living in the north of the Netherlands – with English as the language of instruction. 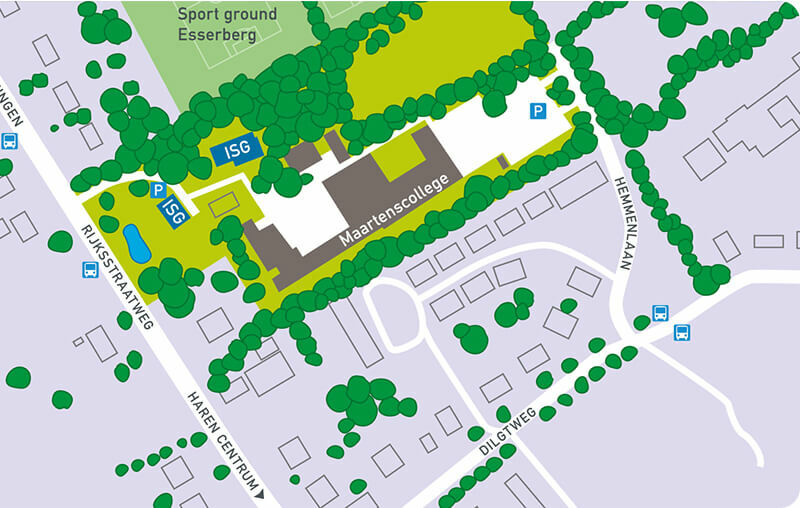 International School Groningen still has strong ties with Maartenscollege. We work closely with our Dutch colleagues, and our students enjoy numerous activities which allow integration within the Maartenscollege community. We try to involve our students in the best way possible. That is why we will inform you of every event through our calender. Be sure to check it once in a while and don't miss out on all the excitement.